TractorFab has been providing photo-etched parts to the farm toy hobby since 2010 - our goal is to provide the highest quality photo-etched parts for toy farm displays and toy tractor modelers in 1/64 scale. My first farm toy was an Ertl IH 5088 with implements set, along with a 1/80 scale IH 1480 combine. While I did not grow up on a farm, farming has been in the family for a number of years. 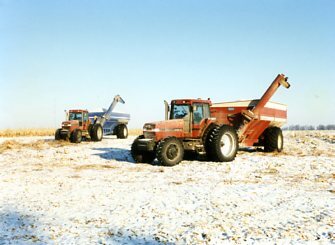 I spent a lot of time on a hog farm when I was a kid, and later worked part time and summers, primarily driving harvest equipment and a grain truck. Coming from the model railroad hobby, it is known that there is a large difference between a toy train and a prototypical model. The same applies to farm toys. Detailing locomotives and freight cars to match a specific prototype was a hobby of mine in the past. An impressive assortment of detail parts are available - cast from metal or injection molded plastic, and also photo etched parts. When exploring the model tractor market, I noticed that there are far fewer choices when it comes to detail parts. Hence TractorFab was conceived. With parts from TractorFab and others, you can convert your "toy tractor" into a highly detailed "tractor model".